Submissions are closed for Starward Tales II from Manawaker Studio. Thanks to all those who submitted. This page remains for reference purposes. 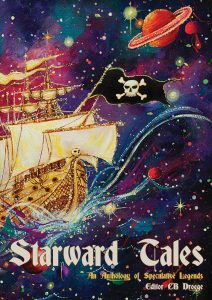 Starward Tales focuses on reinterpretations and retellings of legends, myths, and fairytales in Science Fiction and/or xxxxPunk settings. This volume will contain stories, poetry, and visual art fitting this broad theme. If you wish, you may check out the first volume! However, if you have a take on the theme that doesn’t seem to match what was in the first one, I still want to see it. Currently we are very close to full up on prose, but still need a bunch of poetry and visual art. The bulk of the collection will be short stories. The retold tale can be from any culture and any time period (though special attention will likely be given to non-western tales, since those will be more rare), the setting can be any interpretation of Science Fiction or Alternate History (not looking for classic (high) fantasy settings), and the retelling can be done as loosely or tightly as desired. We’re not looking for “fractured” fairy tales or humor pieces, but we might make an exception if an exceptional one is sent in (certainly there would be room for no more than one of these in the collection). There is no hard word limit, but novellas and above might be hard to find room for. Fiction (one story only, please) should be attached to an e-mail (see below) as an RTF or DOCX file. If submitting a sequential graphic narrative, see the formatting specs in the ‘art’ section below. We are looking for poems inspired by legends myths and fairytales which are placed into alternate settings. Most of the considerations which apply to short stories, above, also apply to poems. Poems (no more than five, please) should be included in the body of an e-mail (see below). If your poem requires special formatting not available in an e-mail, attach an RTF or DOCX file. We are looking for visual artwork inspired by legends, myths, and fairytales which are placed into alternate settings. The interior of the book will contain B&W illustrations to accompany the stories and poetry. The cover of the book will feature a full color illustration. The images don’t have to directly match the texts, but if text and images are submitted together, they may be published together. For legal reasons these illustrations should not feature any depictions of copyrighted characters, locations, or other IP. Visual art is not protected by fair use in this case, so if it looks risky, it will be rejected. If submitting a work for the cover, it should be a 600dpi full color illustration 15″x10″ with a bleed area of 1/2″ inch (meaning all of the important elements are within the central 14″x9″ of the illustration, but the background extends to the edge). Leave room on the right hand side of the image for the title, and remember that the spine will run down the middle. Because this illustration is so specific and labor intensive, we will accept sketched queries. Please include links to sample artwork. If submitting for interior art, it should be a 600dpi grey-scale illustration between 6″x6″ and 6″x9″. All images should be attached to an e-mail (see below) as a lossless PNG or JPG. If sending multiple pieces, ZIP them up first. If too large for an e-mail send link to a dropbox shared folder or similar service (and please leave it shared until it can be evaluated for inclusion). Previously published work is okay, as long as A) it’s over a year past the original publication; B) you let us know where it was published previously, so we can credit them in the book; and C) you have the ability to sell the exclusive print and audio rights. It’s the submitter’s responsibility to ensure they have the rights to their work before submitting. If the work is self-published online (like in a personal blog, forum, facebook, deviant art, etc.) We’d like it taken down upon acceptance into the anthology, and remain down for one year past the anthology publication date. More restrictive rights will be requested for cover art. Submitters may submit in multiple categories simultaneously. If your work is accepted, you will grant Manawaker Studio the right to publish the work exclusively for one year starting at the time of the publication of the anthology. The book may stay in print indefinitely, but is non-exclusive after the first year. The work or parts of it may also be used for promotional purposes in print or online. Original creators will retain all other copyrights. Contributors may also order the physical book at a discounted price, so that they may resell it at signings, readings, and shows without having to bump the cost above the MSRP. All submissions should be sent to submissions@manawaker.com with ‘Starward II Submission’ and your last name in the subject line. Include a brief cover letter and a bio (65 words max) in the body of the e-mail. If you’d like a URL for an online portfolio or blog included with your bio, give that as well. Deadline for submissions is 1 July 2017. There are no plans at this time for a third volume. All submissions sent before the deadline have been responded to. If you submitted before Jul 1, and haven’t gotten a response, something went wrong. Please Query. If you submitted after Jul 1, your manuscript will not receive a response. The anthology will be published in Fall 2017.